We understand you may be concerned your Cervical Smear Test result. 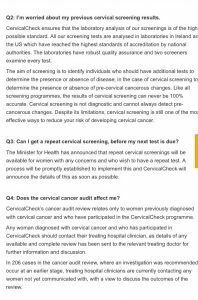 Please be aware, we are currently awaiting advice from the Health Minister’s Serious Incident Management Team regarding the implementation of repeat smears for patients who are not currently due under routine screening with the Cervical Screening Programme. As soon as we receive this notification we will be able to advise you further. Please see the Cervical Check website for further updates.